Not Your Villain is the sequel to Not Your Sidekick, an adorable queer superhero story that couldn’t help but warm my heart. While there’s efforts made to make Not Your Villain work as a stand alone, I think you’re better off reading the series in order. Not Your Villain follows a new protagonist, Bells, who’s got shape shifting powers and has been labeled public enemy number one for rebelling against the League of Heroes and their nefarious schemes. In Not Your Sidekick, Bells and his friends discovered that the League of Heroes and the famous Captain Orion were capturing and experimenting on meta-humans. They try to warn the public, but to no avail; the Collective deletes the information as soon as they post it. And Abbie’s dad is still missing! Their parents are telling them to sit tight while they handle it… but the Sidekick Squad has plans of their own. It took a while for me to get into Not Your Villain. At first I was confused as to whether this would be a sequel or a prequel; it starts before the beginning of Not Your Sidekick, with Bells going off to training and being inducted into the League of Heroes. It then keeps going, through the events of Not Your Sidekick from Bells’s perspective. I don’t think this was a great choice for the structure of the novel; I felt like I was getting bogged down in summary, and I think I would have been confused and off put if I was new to the series. Luckily, after Not Your Villain gets done with backstory and recap, it does a lot better. The second half relentlessly charmed me. The characters are adorable, and the pop culture references made me smile. And how is it that C.B. Lee manages to get me invested in romantic relationships? I’m really not super into romances, and I don’t think any other author has had as high a success rate with me as she has. And of course, I love how inclusive these books they are and how they represent so many queer identities. Bells is a trans man, which is not at all the focus of the book or his personal story line. There may be references to his dad helping him with testosterone shots or wearing a binder, but his story line is firmly focused on superpowers and the schemes of the corrupt government. I haven’t seen any trans reviewers talking about this book yet, but I didn’t notice any problems with the way Bells was portrayed. Also, Bells’s love interest, Emma, is somewhere on the aro spectrum! I think C.B. Lee’s said she’s demiromantic? Anyway, Emma’s still figuring out labels and where she is on the ace and aro spectrum, but this is addressed in the book and the words ace and aro are even used! My little grey-aro, ace heart was happy. I can’t wait for the next book, which will focus around Emma. On another note, I think the world building’s improved with this installment. I feel like I got a lot clearer picture of the Collective and how it operates. We also get to move outside of Andover, which really helped enlarge the picture. I think every sequel needs to expand the world in some way, and Not Your Villain certainly accomplished this. 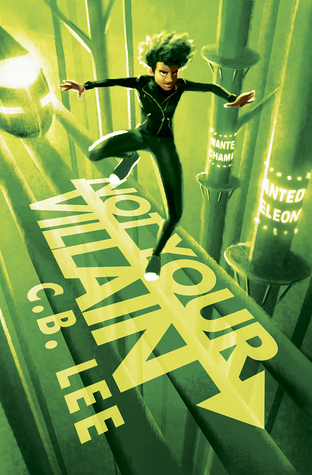 Overall, Not Your Villain is a fun addition to this delightfully queer series. I don’t think fans of Not Your Sidekick will find anything to be disappointed about. Yay, I’m looking forward to it! It’s especially exciting to see more superhero stories with characters with different gender and sexual and romantic identities. Thanks for warning me about the slow beginning — I can power through it knowing that th esecond half becomes awesome. Ohh did you read Not Your Sidekick? I must have missed you talking about it!